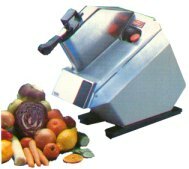 Bench model Vegetable Preparation machines by Sammic, Vector & Electrolux. All available with a wide range of blades and attachments. All Bench model with single phase electrics. The Electrolux TR 250 is designed for larger catering establishments. Either bench standing or on optional mobile stand with either single or three phase electricity supply. Selection of over 70 different cutting plates. Chip cutters, both manual and electric available.